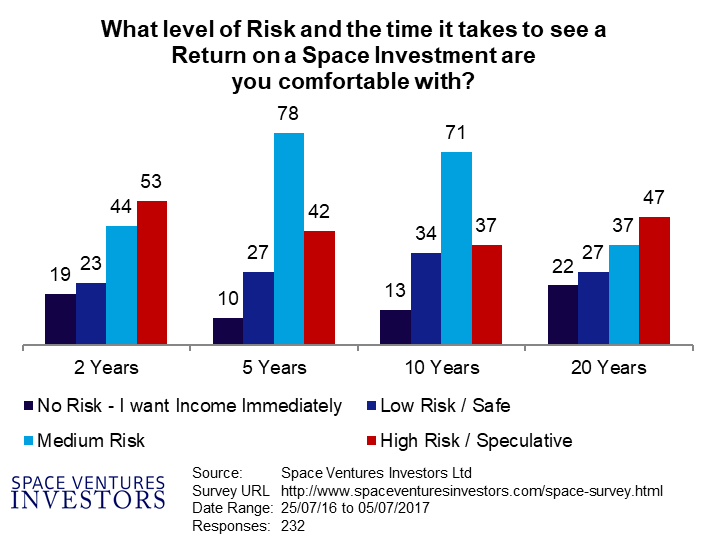 Since 2007 Space Ventures Investors (SVI) has collected data on space investors. These are leads that will be used to structure a space investment based on what prospective space investors want. 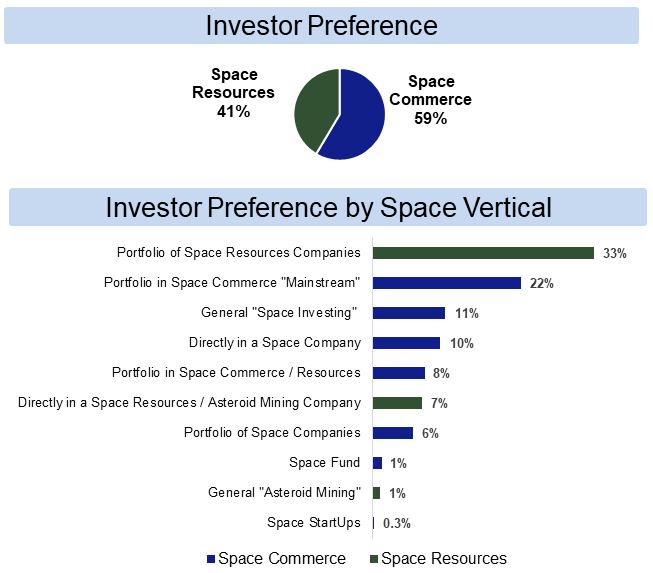 Displayed is SVI’s latest snap shot of investor preferences for space. ‣ Risk mitigation is favourable, e.g. mainstream over new space companies. ‣ Portfolio diversification is key. ‣ Space resources (e.g. Asteroid Mining) is gaining on Space Commerce; satellites, traditional blue chip space companies. ‣ Space Commerce mainstream is always an option for the 'risk averse' but still space friendly investor; Aerospace and Defence ETFs / Mutual Funds, space focussed equities, a SpaceX type of IPO. ‣ It’s still hard work for aspiring space start-ups. By providing your input we are crowd-sourcing ideas to develop a portfolio of space companies that reflect what you want. How much people would want to invest in space. What part of the space industry they would like to invest in. And lastly, their risk appetite. Previous surveys have produced exciting and interesting results, and sometimes we alter our surveys to zero in on specific space industry sectors, like asteroid mining, or space stocks. We do not share your personal contact details with anyone. If you are interested (e.g. as a journalist or student) in finding out about the emerging trends we’re monitoring thanks to our Space Investment Survey Results, then please Contact Us.